David Zhao, MD, PhD, conducts translational research that focuses on hybrid coronary revascularization and stem cell cardiac therapy and pioneers cardiovascular percutaneous and surgery techniques. He collaborates with industry partners to improve cardiovascular patient care through research projects in interventional cardiology. David Zhao, MD, PhD, earned his medical degree from Shanghai Medical University in 1985 and then studied immunology at Queensland University. He completed a residency in internal medicine at Vanderbilt University Medical Center and fellowships in cardiology and interventional cardiology at Harvard Medical School. Before joining Wake Forest School of Medicine’s department of cardiology in 2013, Zhao worked in the divisions of cardiovascular medicine and cardiothoracic surgery at Vanderbilt University Medical Center for fourteen years. David Zhao conducts translational research that seeks to optimize patient care in cardiovascular diseases, such as coronary artery disease. He pioneered hybrid coronary revascularization, a novel treatment for coronary artery disease that integrates different aspects of coronary bypass surgery and percutaneous interventions like angioplasty. The procedure combines bypass artery grafts with drug-eluting stents, resulting in a minimally invasive approach that improves surgical outcomes, quality of life, recovery time and cost effectiveness. Zhao’s other research interests include early studies that examine stem cell therapy in acute myocardial infarction and chronic heart failure and that use stem cells to replace scar tissue. He also studies patient management strategies for valve disease using transcatheter aortic valve replacement (TAVR) and transcatheter mitral valve repair (TMVR), which are innovative, minimally invasive, nonsurgical procedures that Zhao performs at Wake Forest Baptist Medical Center. 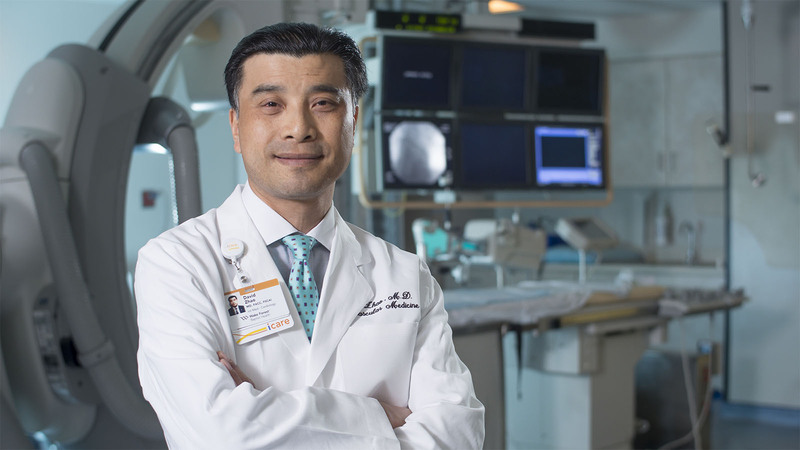 In his role as director of the Heart and Vascular Center of Excellence, Zhao oversees clinical operations, strategic development, patient care, cardiovascular research and education programs. He partners with universities and hospitals in China on global health initiatives that promote cardiovascular health educational programs, with plans to expand efforts to other developing countries. Zhao collaborates with industry to advance science and cardiovascular patient care by serving on scientific advisory boards, assisting with clinical trials and helping with product development from a scientific standpoint. He partners with industry on various research projects in interventional cardiology and sees these interactions as critical for both parties. Research and patient care inform the devices and therapies that industry develops, and researchers and physicians benefit from the technologies and resources that companies can provide.